Between the two of us, we’ve spent more than three months out of our lives gallivanting around Italy. However, there was one area yet to be explored – Trentino. 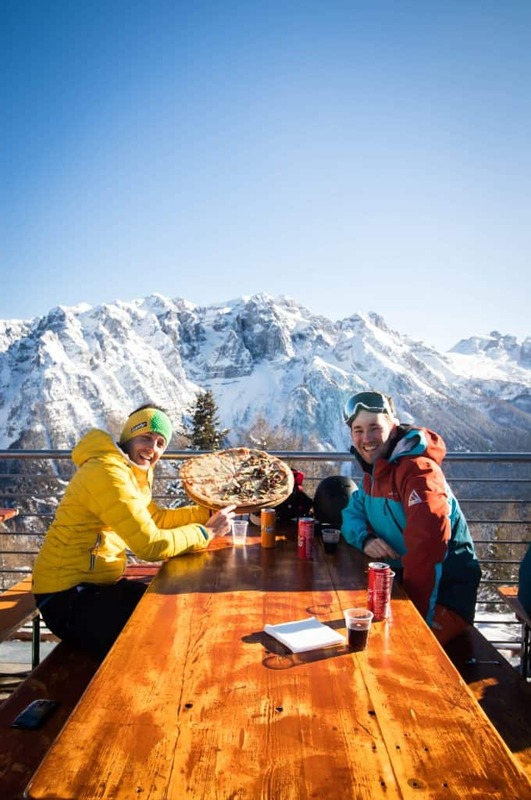 After sipping cappuccinos in Florence, eating the best pizza ever in Naples, and basking in the sun in Sicily we knew had to get to one of Italy’s best ski destinations. The Trentino region of Italy lies Northeast of Milan and is only a short drive from the Bergamo airport. 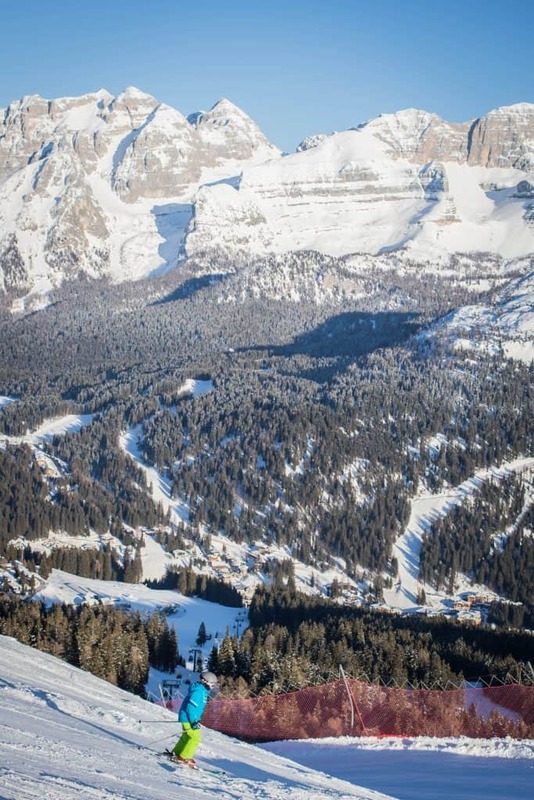 It’s home to the Dolomites, beautiful mountain villages, and 800km of pistes. 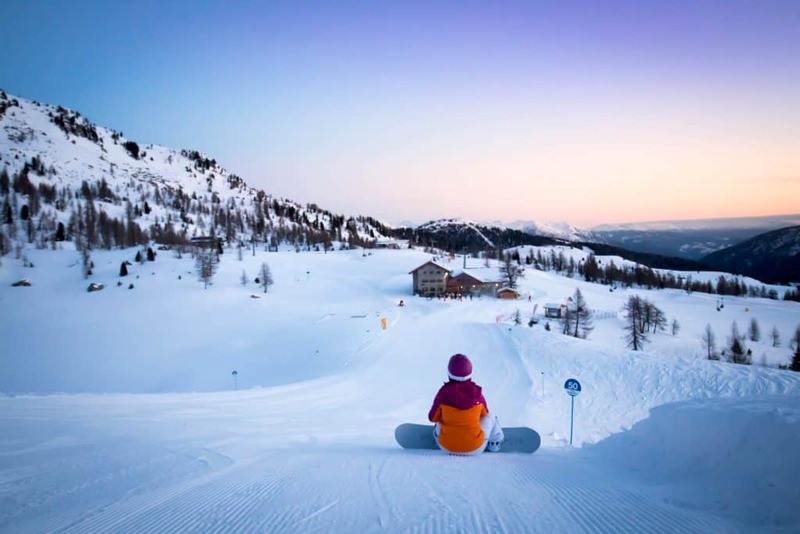 When planning our snowboarding trip to Italy we landed on traveling to the most famous ski resort in the Dolomites, Madonna Di Campiglio, and the neighboring area of Val Di Sole. In case it’s news to you we’re in love with Italy. We have often thought of setting roots down in the country and learning Italian. So, it shouldn’t have been much of a surprise that we would fall in love with the Italian mountains as well. What surprises us the most is just how much each region varies all within one small country. For anyone wanting to taste a little adventure in Northern Italy here is what you can expect. 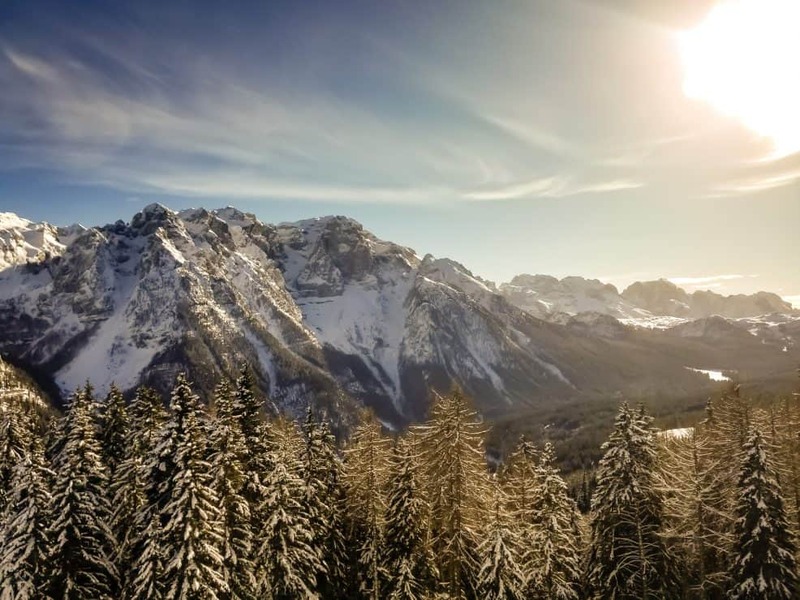 The driving force of winter tourism in the Trentino region lies in Val Di Sole. 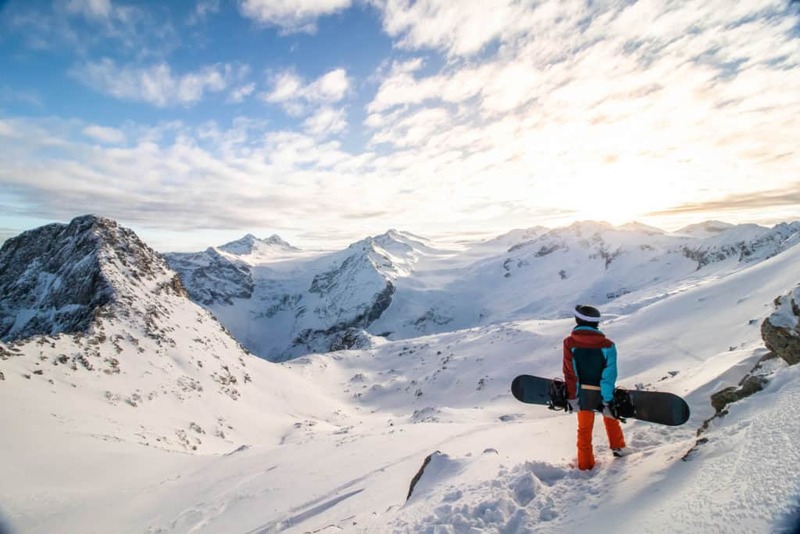 A large valley with a number of linked ski resorts that can offer 380km of pistes, 150 lifts, and a nice selection of free ride opportunities. The entire region is accessible with the Superskirama ski pass. Tonale Pass is a small town along the road crossing through Val Di Sole. It sits at a high elevation which often provides it with great snow conditions. When we arrived we found mounds of snow and a two-meter base, a much different feel than our previous week in warmer Bansko, Bulgaria. There are a number of charming hotels and the mountains rise 2200 meters above on either side of the pass). It’s here where we began our epic snowboarding trip. After spending the night in the family-run Sporting Hotel with friendly owners, good food, and a wellness center we were ready for the mountains. 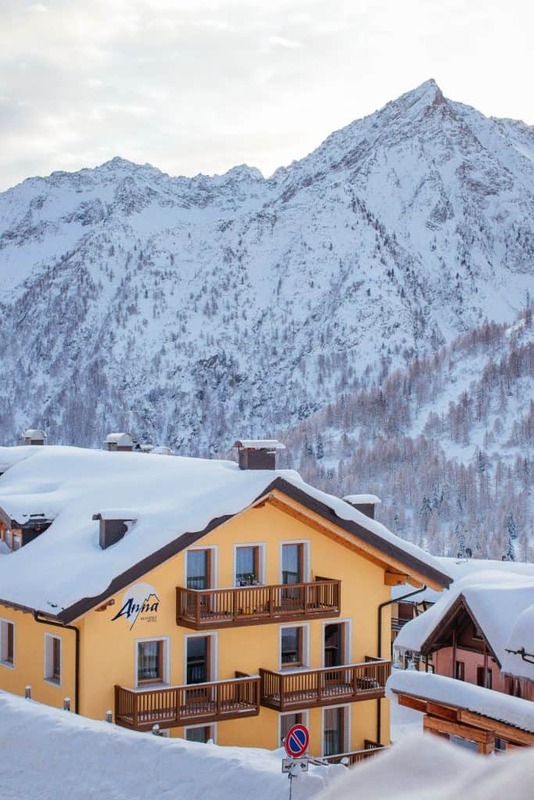 Accommodation and lift tickets in Passo Tonale are both known for being very affordable. Half board accommodation including a spa starts at only €70 an adult, while a lift ticket costs just €54 a day in the high season. Compared to North America, that is a steal. 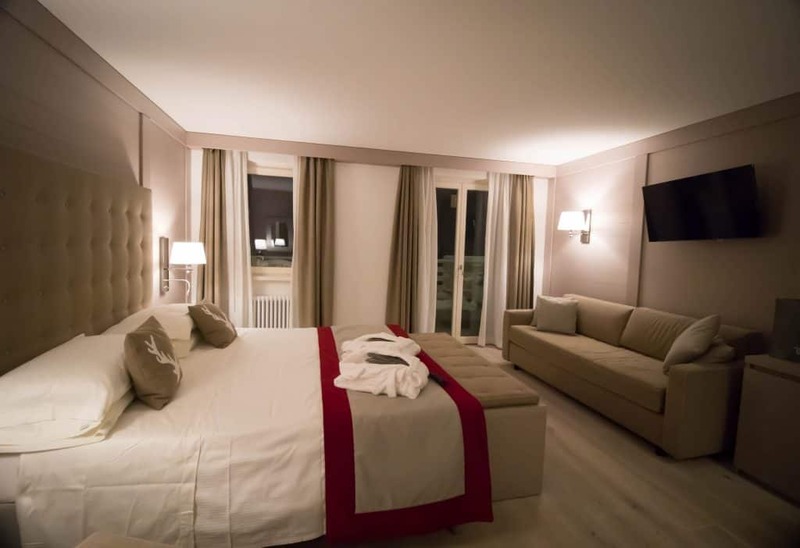 The region is only a little over two hours from Bergamo airport, which is serviced by low-cost European carriers. This means you get great value and could easily have a week-long ski holiday for around €1,000 a person! The ski pistes extend to the North and South of town. All is connected via a gondola and ski road to the ski area of Ponte di Legno. To the North, the runs are mostly beginners and intermediate with gentle wide slopes drawing many families who come to learn how to ski. 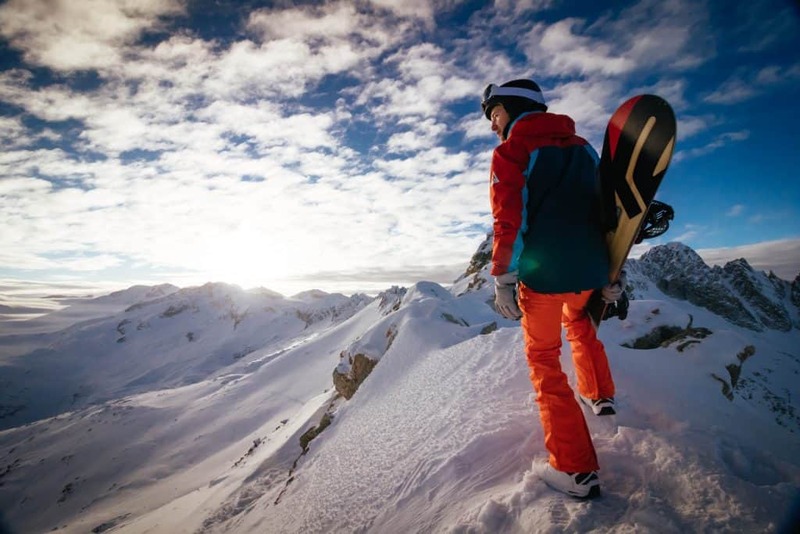 To the South is the highlight for more avid snowboarder and skiers, the stunning Presena Glacier. We didn’t know what to expect when as we were riding up the gondola to the Presena Glacier. It’s widely celebrated for its free riding opportunities and ski routes. 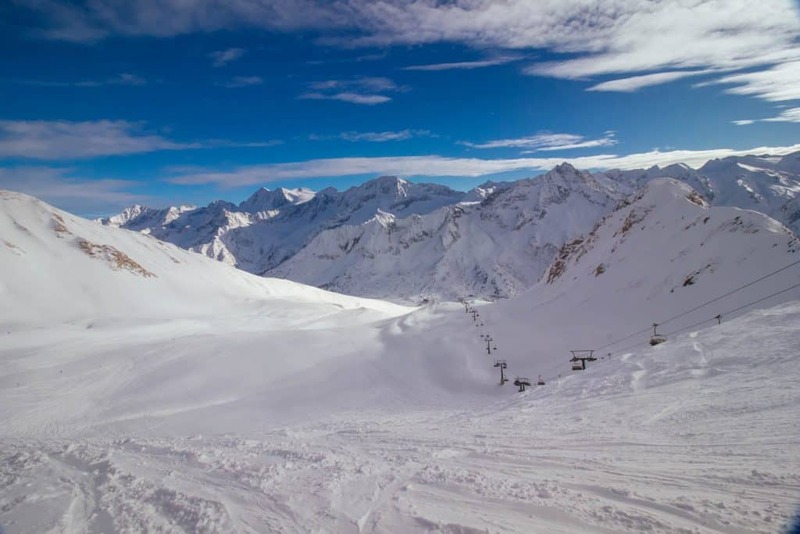 The glacier is easily the highlight of Tonale Pass as it’s a year-round ski destination. 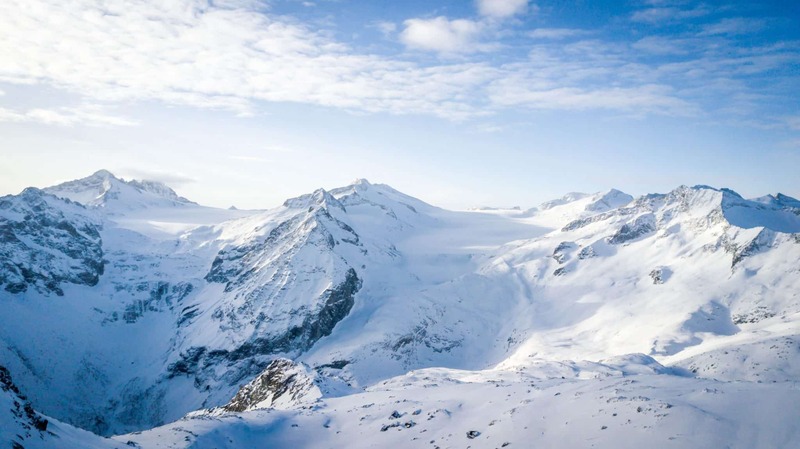 With a new gondola, visitors can reach the top of the glacier in a short fifteen minutes, the amount of elevation climbed in such a short amount of time is truly impressive. Oh and there’s also the world’s most scenic cafe at the top, so grab yourself a cappuccino and enjoy the view – you’re in Italy after all! 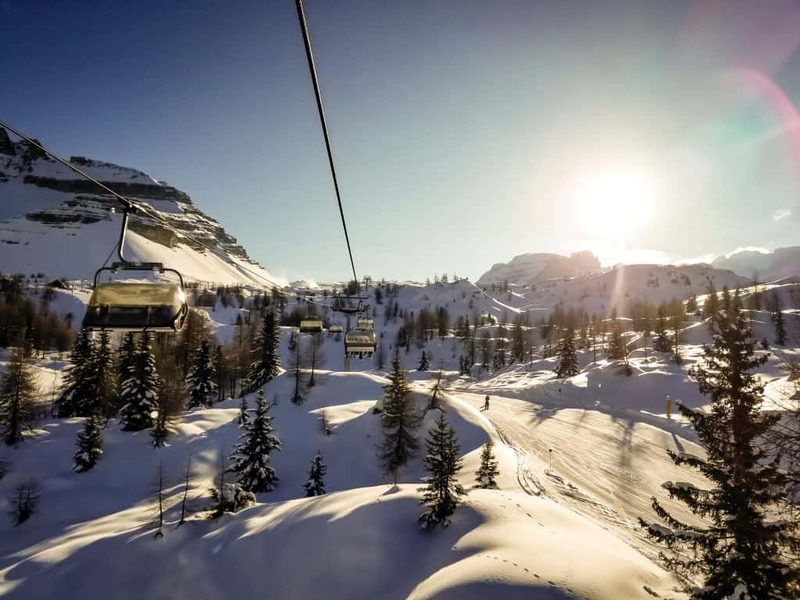 The gondola does not present a wide range of pistes, but it does offer one of the most famous pistes in the Trentino region with Paradiso and a plethora of off-piste opportunities. To take advantage of the free ride opportunities in Tonale Pass it’s best to hire a local guide who knows the area best and can help you with your form, you’ll also want to make sure you have an avalanche beacon for safety. The piste route, Paradiso, is a fun black run that covers around three kilometers and 750 meters of descent. It connects with a ski run that leads directly into the neighboring town of Ponte De Ligno. Besides the glacier itself, the highlight for us was the opportunity to stay in the Capanna Presena. 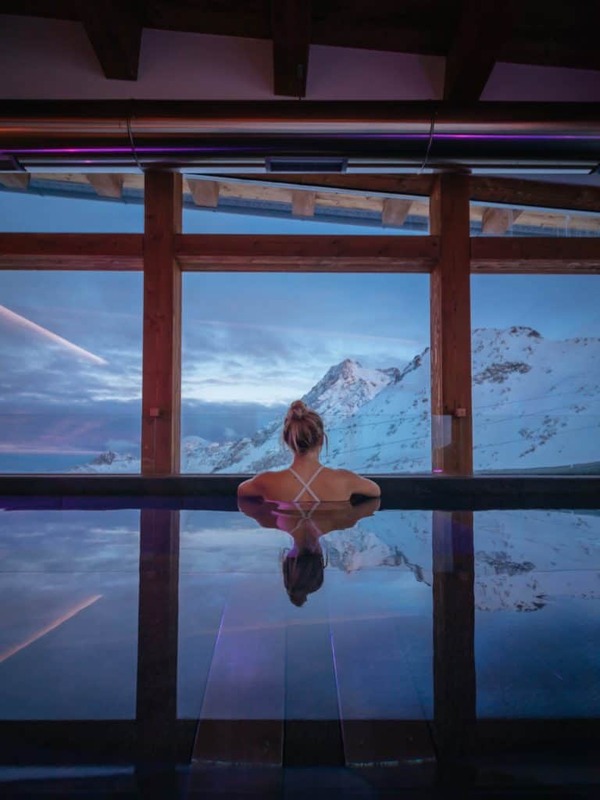 A mountain hut that sits on the glacier and provides guest solitude and a chance to connect deeper with the mountains. 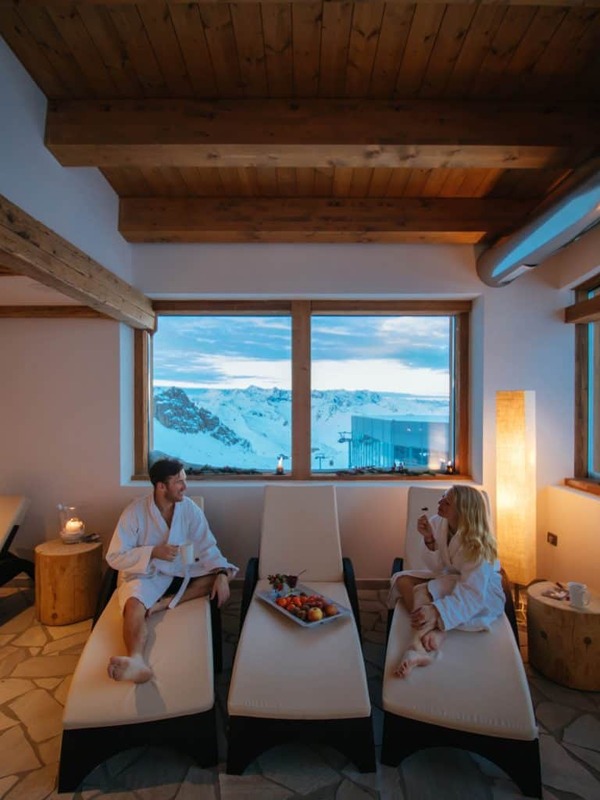 Anyone who has the opportunity to stay will thoroughly enjoy the amazing spa with a whirlpool, sauna, and infrared saunas that provide breathtaking views over the mountains at sunset. You also have the chance to wake up, watch sunrise, and enjoy the first runs of the day with freshly groomed slopes. Even if you aren’t staying overnight, Capanna Presena has a fully serviced kitchen and welcomes outsiders into their wellness center for a fee. Our third day in Trentino we made our way to Folgarida, it is linked with the famous ski town of Madonna Di Campiglio, Marilleva, and Pinzolo. Together they make up one of the largest ski regions in Italy and offer over 150km of piste. Folgarida is not a particularly hard mountain, but they do have a newly opened black run that hits an incline of 70%!. The highlight of Folgarida for us is how family and beginner friendly the resort area is for visitors. The mountaintop features a family fun park with a number of closed bunny hills, tube parks, and rides for kids learning to ski. 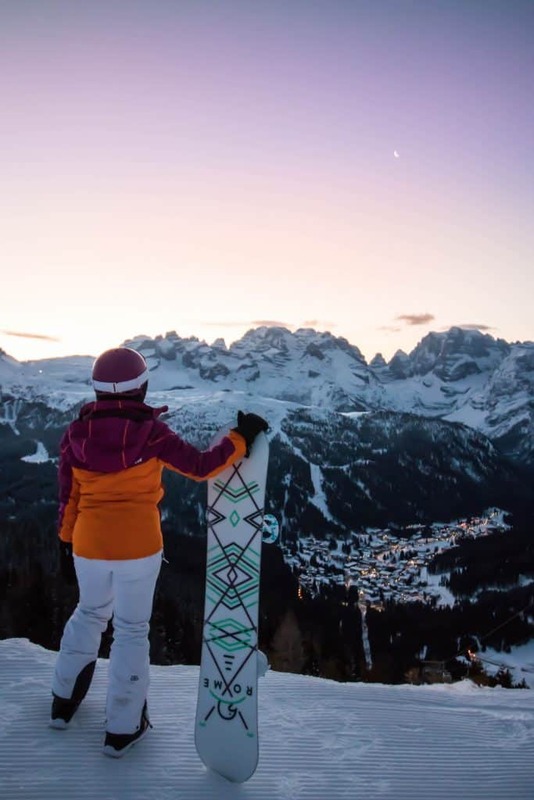 A number of ski huts and restaurants sit along the mountain tip and have amazing views over the Dolomites and Madonna Di Campiglio. We took advantage and had the best view you can with pizza in Italy. This is the jewel of the ski scene in the Trentino region. It’s a well-known resort that is famous for hosting many Italians looking for solid skiing, dining, and relaxation in a very posh environment. In fact, it still holds on to its claim to fame as the summer vacation spot of Austrian Royalty and Princess Sissi. The town is a beautiful little gem set at the base of the Dolomites and has all the charm of a mountain town. The town is nearly car-free and it’s easy to take an evening stroll after a day on the slopes. We spent our evenings window shopping while checking out the 19th-century architecture with a cappuccino in hand. Charming wooden homes line the streets at the foot of the Dolomites. It is easy to see why the resort town is well cherished in Northern Italy. When it comes to the pistes on the mountain they are well maintained and groomed daily. With tremendous weather and recent snowfall we experienced the mountains at their peak. Our days were filled with sunshine and fresh lines that had perfect packed powder conditions. Fun fact, a freshly groomed slope is referred to as “spaghetti” in Italy – fitting! This is something visitors can learn about with the new activity Trentino Ski Sunrise. 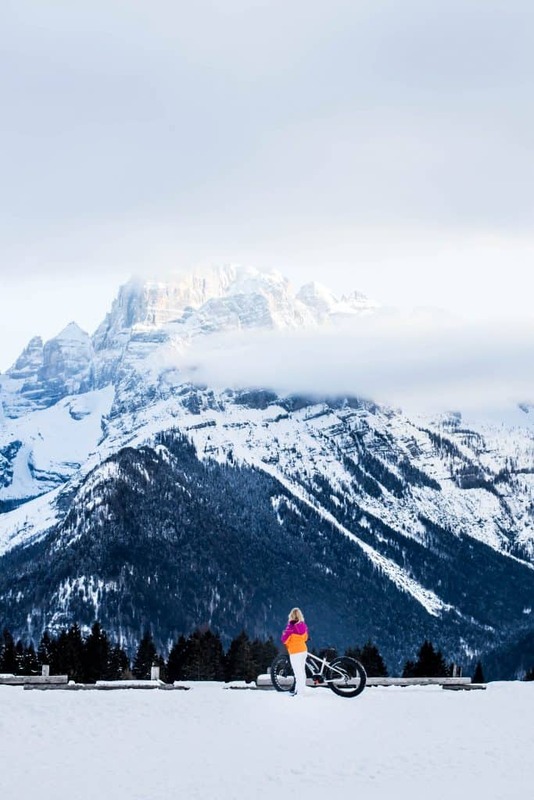 On Tuesdays throughout the ski season a small number of guests are given the opportunity to catch the gondola or chairlift up the mountain before official opening time. It’s available to anyone that can ski or snowboard, as the ride sticks to the blue rated beginner slopes. 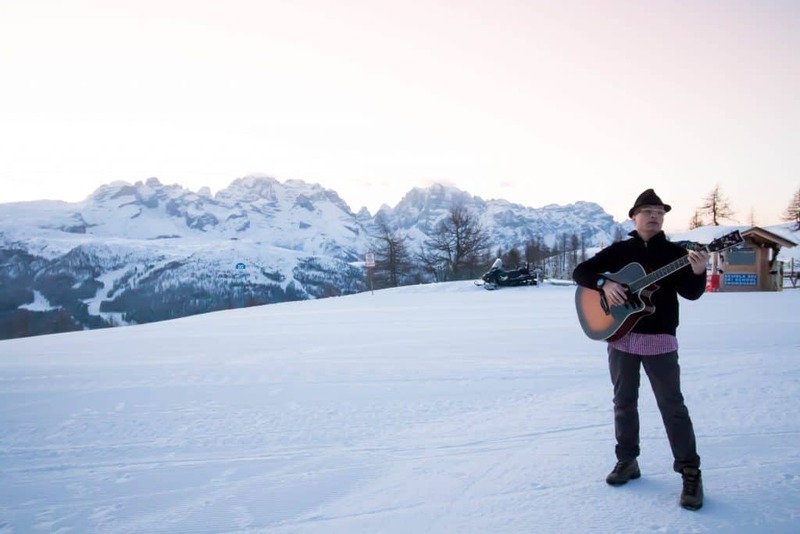 You head up the mountain just as the day breaks to enjoy an Italian breakfast with music and then head down for the first run of the day. We found the food on the mountain and off to be wonderful with influences from Austria and Italy very evident. You have beautiful dishes like alpine cheese stuffed ravioli or seared mountain trout. Oh and with it being Italian there is no shortage of great wine to be had even on the slopes. 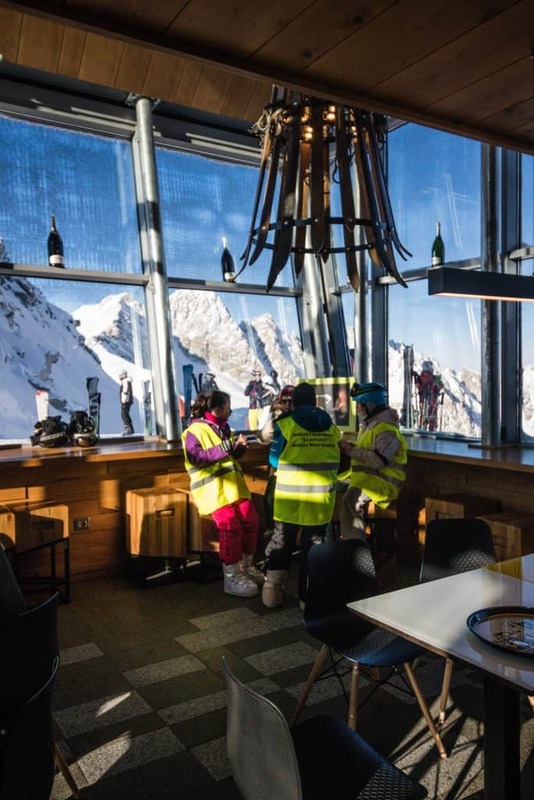 We enjoyed spritz and sparkling wine, trentodoc, as midday aperitifs, as did everyone else, before hitting the slopes again! 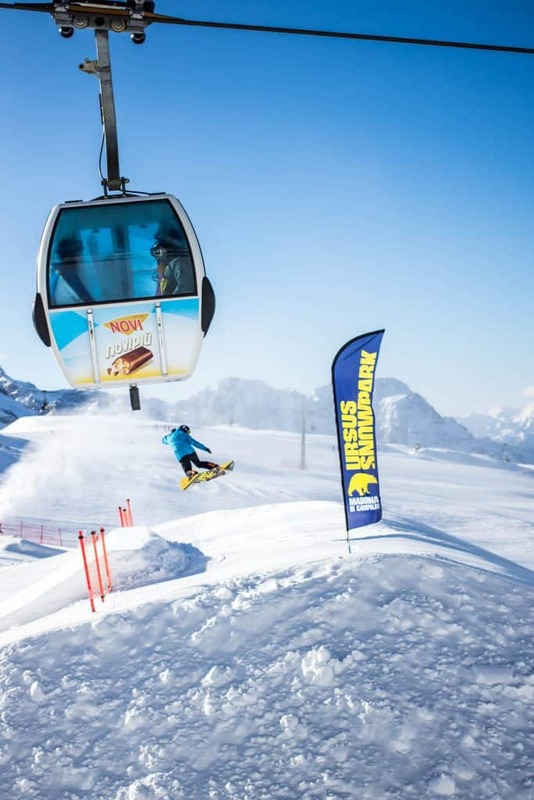 Situated on Passo Groste and accessed via Gondola, the Italian cool continues with the snow park. The park attracts a crowd of snowboarders and skiers looking to hit big jumps and rails in the Ursus Snowpark. The ability for the park riders to buy tickets at a discounted rate for access only to the park does draw in a crowd. Jumps are well maintained and designed using state of the art technology that ensures rider safety and most of importantly the perfect air. Snow conditions should never bee too much of a fear as even in the shoulder seasons the resort has impressive snowmaking capabilities that are sure to deliver. So riders who stick to the pistes are sure to never grow bored. 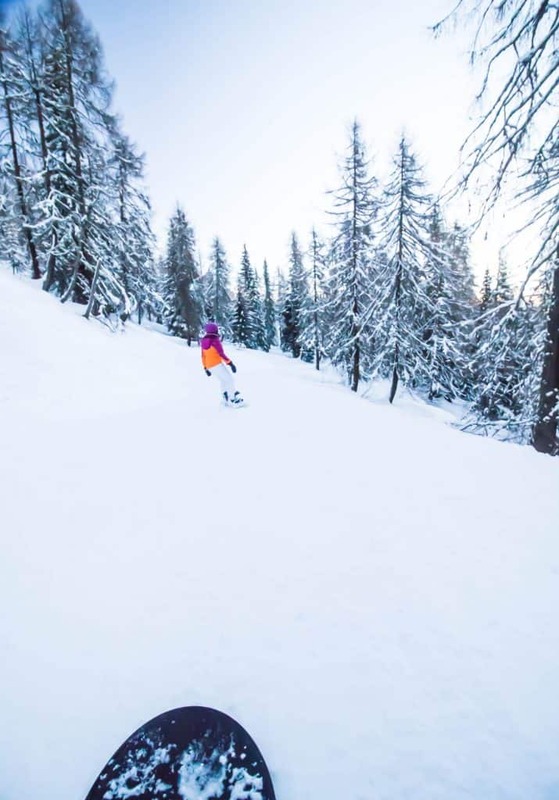 However, the free ride and off pistes opportunities are not as great around Madonna Di Campiglio as the majority of its ski area is in a UNESCO world heritage protected national park that inhibits free riding, plus the slopes are rather gradual around Passo Groste. 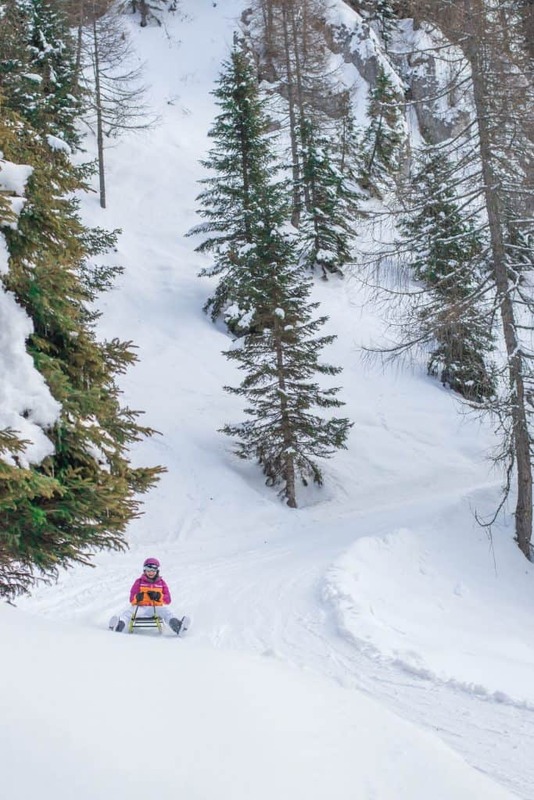 Never the less, Madonna Di Campiglio has something for everyone! There are challenging runs that are steeper on Mont Spinale and the linked Pinzolo resort. We had a few nice runs down Spinale, before breaking for lunch at their latest mountain restaurant. It’s really a tremendous ski area that has so much to offer. We snowboarded three days straight and never found ourselves repeating the same runs over and over. Activities abound for those who do not want to strap into a snowboard or a pair of skis. We had a few exciting activities on our agenda. First up for us was tobogganing, or sledging! After spending our days on snowboards we didn’t expect to find the sledging to be such a thrill, but we were dead wrong. You’ll fly down the mountain on a maintained, but fast, track laughing the whole way while trying to avoid flying into a big pile of fresh snow. The perfect activity for friends and family. On our last day we left the busy weekend slopes and spent the evening riding through the forests on fat bikes. The bikes have wide tires that are able to grip in the snow and electric motors to help make it up hill. The bike ride through the forest is relaxing and provides wonderful views over the Dolomites and Madonna Di Campiglio without many people around. There are other activities to enjoy such cross-country skiing, snowshoeing, or winter hiking trails as well. However, the whole star of the show here has to the natural beauty of the Dolomites. There are few mountain ranges in the world that can compare. I remember long ago seeing a photo of the mountain range and knowing that I would one day have to see it myself. So, it shouldn’t be much of a surprise that we were enamored by Madonna Di Campiglio. 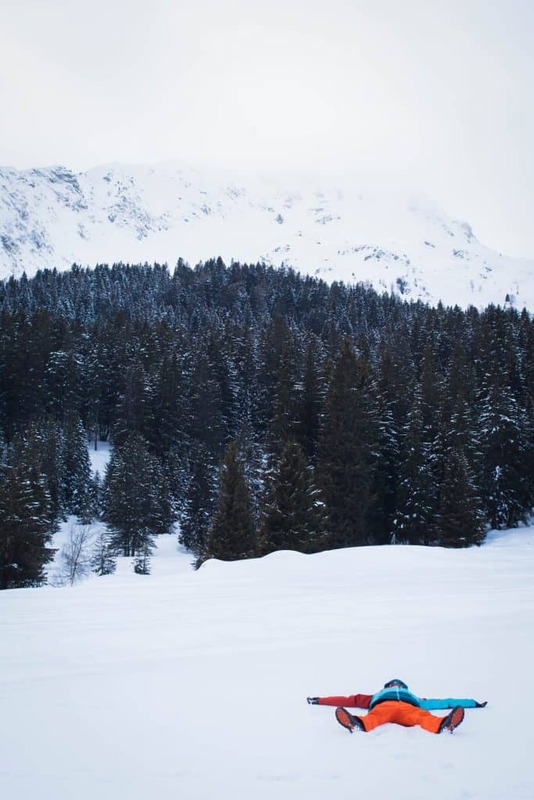 You will have a hard time finding places that you can ski or snowboard that are more scenic. 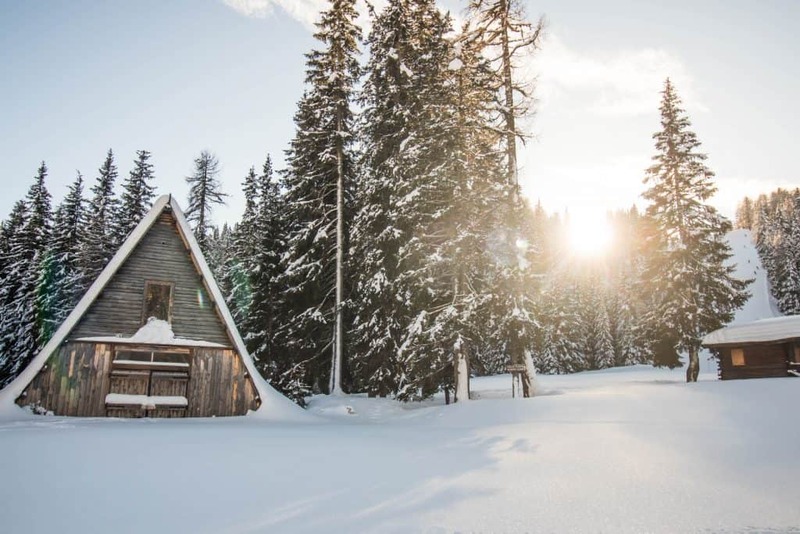 There are a plethora of great places to stay in Madonna Di Campiglio and Val Di Sole all with plenty of charm. Overall, we find them to be a great value compared to prices in Switzerland or France, while they still deliver a high level of service. Something for those to consider when looking to save money on a ski vacation in the Alps. We stayed at the four-star Hotel Miramonti. The hotel has a charming lobby, sauna, bar, and restaurant. To make things better we found a modern spacious room with all the creature comforts we could want. While staying at the hotel on a half board basis we had a nice selection of food from the chefs at the hotel. Our first visit to the Val Di Sole region of Trentino and Madonna Di Campiglio was a fantastic introduction to ski in Italy. What surprises us the most is the lack of name recognition Italy has back home in the states when referencing ski/snowboard. We hope to one day return to Trentino and explore more of what the region has to offer. It has a great strength in offering an amazing mountain experience for much less than it’s Swiss and French counterparts. However, what drove it home for us is the sheer natural beauty of the Trentino region and Val Di Sole.